Pictures courtesy of the creative folks at Flickr Creative Commons. Thanks! Other pics taken from Google StreetView (thanks there too! ), and one picture of my own. NOTE: Hopefully, you're not doing this in the summer, otherwise you'll need to jump into the water a couple of times to avoid heat stroke! It's best to run early in the morning or in the evening. 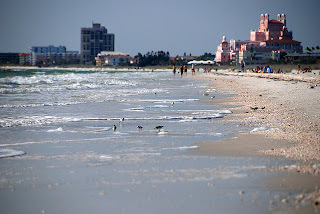 My favorite Gulf of Mexico beach neighborhood in the Tampa Bay area (I lived there for 3 years) is Pass-A-Grille, at the southern tip of St. Petersburg Beach. 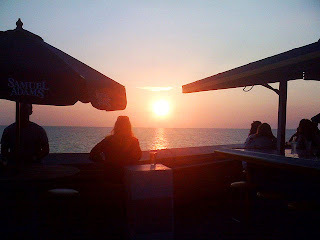 This is the place to be for relaxed Florida living, the way it should be. Pass-A-Grille is a collection of little cottages -- some of them are nice and some are a bit junky -- and a sprinkling of smallish apartment buildings at the end of St. Pete`s main beach island. There isn't much traffic, and there are views over the Gulf to the Shell Key preserve to the south. 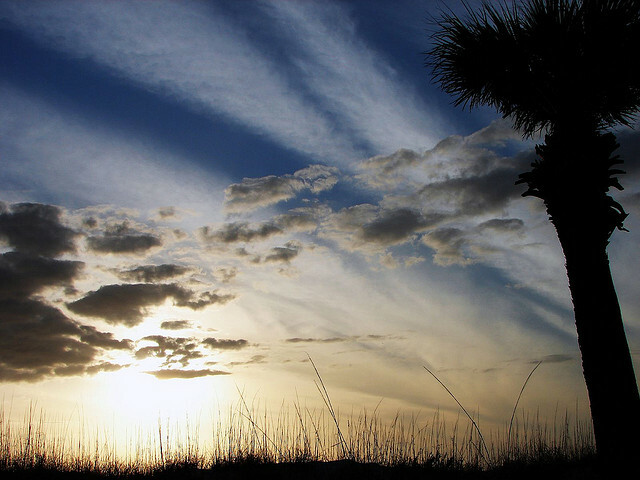 It hasn't been spoiled by gigantic condominiums, hotels and loud streets that infest most of the Gulf beaches, making it an ideal spot for a nice run, especially at sundown, when you can watch the sun set out over the Gulf. 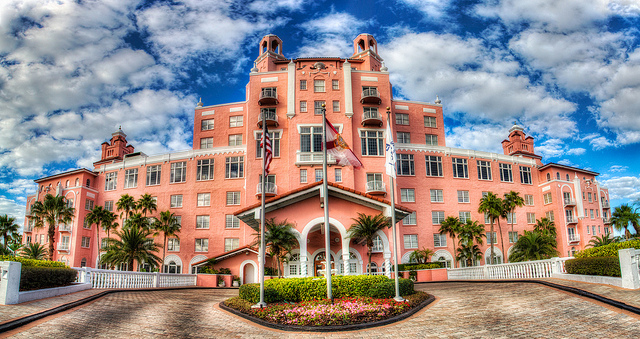 The only big hotel in the area is the beautiful, big, pink wedding cake, the Don CeSar, a Spanish-styled legend dating from Florida's earliest tourism days (1928, ancient by Florida standards). The Don marks the north end of Pass-A-Grille. Beyond that is a solid line of hotels, condos and tourist stores along St. Pete Beach. Nobody knows how Pass-A-Grille got its name. Like about all Florida beaches, it occupies a sand island separated from the mainland by a lagoon. The north-south-oriented island is only 100-200m wide for its whole length, with a beach along the western shore, facing the Gulf of Mexico. The road called Gulf Way runs along the beach. Pass-A-Grille Way runs along the eastern shore, facing Tierra Verde, an island at the entrance to Tampa Bay. The area south of 15th Avenue is the oldest part, Historic Pass-A-Grille. This run will basically loop once around the town, from the southern tip to the Don in the north, with a few zig-zags along the side streets to get a taste of the neighborhood. We'll start at the beach, at the corner of Gulf Way and 10th Avenue. There is a snack bar on the beach here, the Paradise Grille, and beach showers. This is the hangout every evening when the sun goes down: people sitting on the colorful Adirondack chairs, the cement ledge or just sitting in the sand, sipping their drinks and waiting for the magic to do its stuff. There's nothing like a Florida Gulf sunset. Maybe plan your run to get back here in time to shower off and drink a sun-downer! Look around you: the beach stretches north and south of here, with sea-oats growing in the dunes. Right behind you is Pass-A-Grille Park with its shuffle-board courts, and the big grey 2-storey restaurant is the Hurricane, a good place to hang out with a beer and a grouper sandwich. Turn south, with the water to your right and run down along the beach. You could either run on the sand or on the paved sidewalk, as you prefer. If you decide for the sand, you can just take off your shoes for this part. I would recommend to run down next to the water, where the sand is packed together. The loose, dry sand is pretty tough going, more like "spinning" than running. Run the 800 meters, all the way to the south end of the island. There is a little fishing jetty going off to the right, into the Gulf. 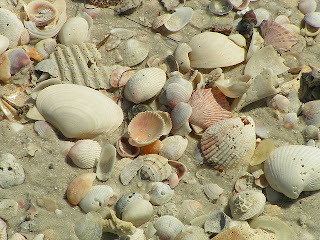 Run to the jetty to get a view of Shell Key and its mangroves to the south, in the mouth of Tampa Bay. But because the southern tip of the island is covered by a boring apartment building, turn north and run back a block to 2nd Avenue, where you turn right and run eastwards from there, past the little cottages. 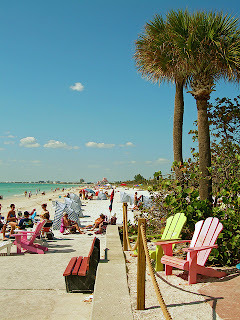 In just 150 meters the street ends at Pass-A-Grille Way, where you turn left and run north along the water on that side, with a view of the waterfront homes of Tierra Verde in the distance. Now run north till you reach the little fishing pier at 7th Avenue, where we'll turn left and run down this nice side-street, too. Back at Gulf Way, turn right and run north for just a block to 8th Avenue, where we'll turn right again. This is the old business block for the neighborhood, now housing mainly tourist boutiques. You'll hit Pass-A-Grille Way again at the Merry Pier and its bait shop, where you turn left and continue northwards. In just a block you'll come back to Pass-A-Grille Park. Run to the north end, 10th Avenue, and turn left to run west past the shuffle-board courts. This used to be St. Pete's favorite sport: you could find retirees everywhere shuffling their discs from one triangle to the other. I don't know how much they're still used today. On the right side, you'll pass the Gulf Beaches Historical Museum in a little beach house. Also notice that there are some little white-dirt alleyways connecting the side-streets north/south. I like running down them to get an even better feel for the neighborhood, maybe try out a few! At Gulf Way, turn north and run till you get to the next little park, at 15th Avenue. Turn right here and you'll go by basketball courts, a baseball field and tennis courts, for those of you interested in other sports. The houses on the south side of the street are also quaint enough. Now we'll run up Pass-A-Grille Way for a while, passing a big blue barn of a place on the right, the Pass-A-Grille Marina. Just after the marina, you'll pass my favorite Pass-A-Grille restaurant, the Wharf. The Wharf has a line of tables out back along the water where you can sit and fight the seagulls for your fish. Boaters come right up to the dock and get out to eat. Run a block past Pass-A-Grille's only traffic light, and turn left at 22nd Avenue. This nice street marks the northern part of town with no houses directly on the beach. Turn right on Sunset Way and there are homes lining the beach here as we run north again. At 28th Avenue, you have to make a short detour to the right, and at 31st Avenue a zig-zag to the left to continue northwards. But at 32nd Avenue, that's the end of quiet back-streets. An apartment building, called Marina Bay, is blocking your way. You have to turn right here and run to Gulf Boulevard (Pass-A-Grille Way changes its name here) and turn left to keep heading north. There is more traffic along this section, but it's still not bad. And in just 400 meters, you'll be coming up to the gigantic pink monstrosity of the Don CeSar. Just past the hotel, you'll see a big intersection, where the Bayway heads off to the right to go island-hopping past the southern tip of St. Pete. But let's stay away from traffic. Just before you get to the Don, turn left and run through the little parking lot. Continue westwards on the sand path through the dunes towards the back of the hotel, then follow it as it curves to the right, onto the hotel's section of beach, with its beach chairs and pool. It's a beautiful spot. This is the northernmost spot on the route. Now, just head south along the water (shoeless is the way to go here), and enjoy your 2-kilometer way back, dodging the waves, watching the gulls, sandpipers and pelicans, viewing the shells. Soon you'll be back at the snack bar and your shower. Try to stick around for the sunset. When a few clouds line the western horizon, the sunsets are especially spectacular, with the clouds glowing when the red sun lights them from below, sending a shower of sparks off across the water. Time to try that well-deserved sun-dower, my good runner!